The 3V-CPI as it will be mounted on the G-V for SEAC4RS. Some examples of the resolution possible for 3V-CPI data output. The Three-View Cloud Particle Imager (3V-CPI) measures the size, shape and concentration of water drops and ice particles in clouds. The probe is a combination of three imaging instruments. Two of them comprise a 2D-S (Two- Dimensional Stereo hydrometeor spectrometer), in which two high-resolution (about 9 mm resolution) 2D probes image particles as they pass through laser beams that are orthogonal to each other. If particles also lie in the intersection of the sensitive areas of the two beams, they are seen by both 2D probes. In that case, the third instrument, a Cloud Particle Imager (CPI), is triggered to take a high-resolution picture, via a briefly illuminated high-resolution imaging array. 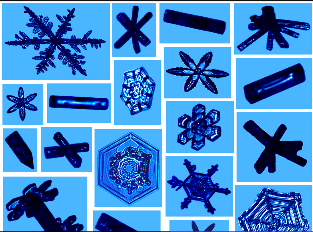 This image has a pixel size of about 2.3 µm and so provides very high resolution for determining shapes and habits of ice crystals. The probe is particularly suited to imaging such crystals, but also provides good detection of other hydrometeors including large cloud droplets, drizzle and small rain drops, and other precipitation particles. Lawson, P., et al. (2001), An overview of microphysical properties of Arctic clouds observed in May and July during FIRE.ACE, J. Geophys. Res., 106, 989-15.